For smooth conduct of examinations through a large network of examination centres/sub-centres situated in different parts of the country for the convenience of the candidates, the Commission has been provided with a Regional set-up. 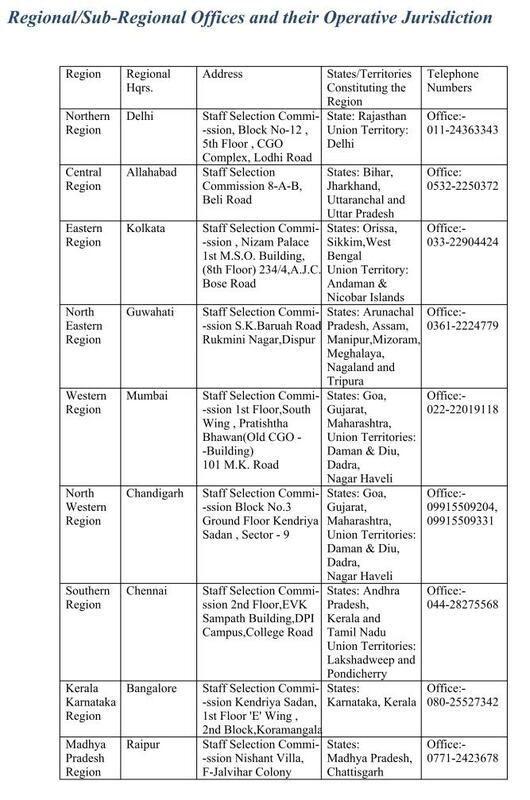 The details of Regional and Sub-Regional Offices are given below. 1. To make recruitment to (i) all Group “B” posts in the various Ministries/Departments of the Govt. of India and their Attached and Subordinate Offices which are in the pay scales the maximum of which is Rs.10,500 or below and (ii) all non-technical Group “C” posts in the various Ministries/Departments of the Govt. of India and their Attached and Subordinate Offices, except those posts which are specifically exempt from the purview of the Staff Selection Commission. 2. To conduct examinations and/or interviews, whenever required for recruitment to the posts within its purview. The examinations would be held as far as possible at different centres and successful candidates posted, to the extent possible, to their home State/Region. 5. The Commission conducts periodical Typewriting Tests in English and Hindi. 7. The Commission conducts examinations/selections for recruitment to all Group “B” posts which are in the pay scales the maximum of which is Rs.10, 500 or below and all Group “C” non-technical posts in the Ministries/Departments of the Govt. from time to time. 8. The Commission performs such other functions as may be entrusted to it by the Central Govt. from time to time.